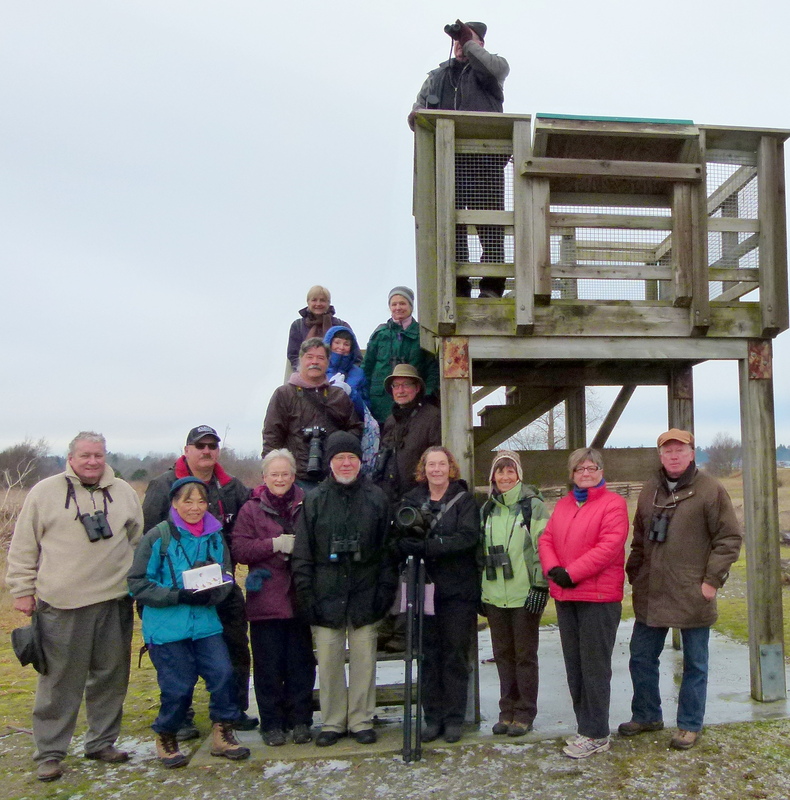 Over 20 folk participated in one way or another in our quarterly Birds on the Bay (BOTB) outing in Boundary Bay Regional Park (BBRP) on Wednesday, December 11. The weather was cool and clear, the Bay unusually covered with ice; we had some neat sightings and got some beaut photos, but the hi-lite was the delicious spread put on by the Delta Nats Ladies following the walk. Check out Terry’s, Glen’s, Roger’s and hopefully other’s photos on the DNCB Picasa link. 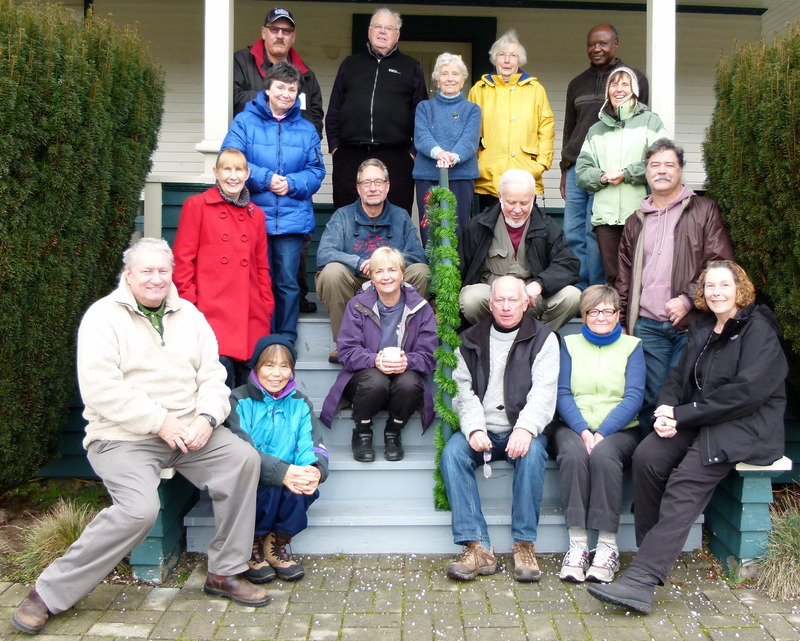 We met at Cammidge House (CH) at 9:00 a.m. and following introductions, especially the main BOTB facilitators Don & Rochelle, we began our amble toward Centennial Beach. A pair of Bald Eagles and a “kite-eagle” perched in the big tree entertained our affable newbie Otto. Our path to the pond was blocked by a fence as Metro Vancouver is well-advanced with construction of picnic stands, baseball diamond and pond enlargement and enhancement, including much-needed aerators. There were a few Mallards and American Wigeon hanging around the frozen pond and a flock of Red-winged Blackbirds and Starlings nearby. 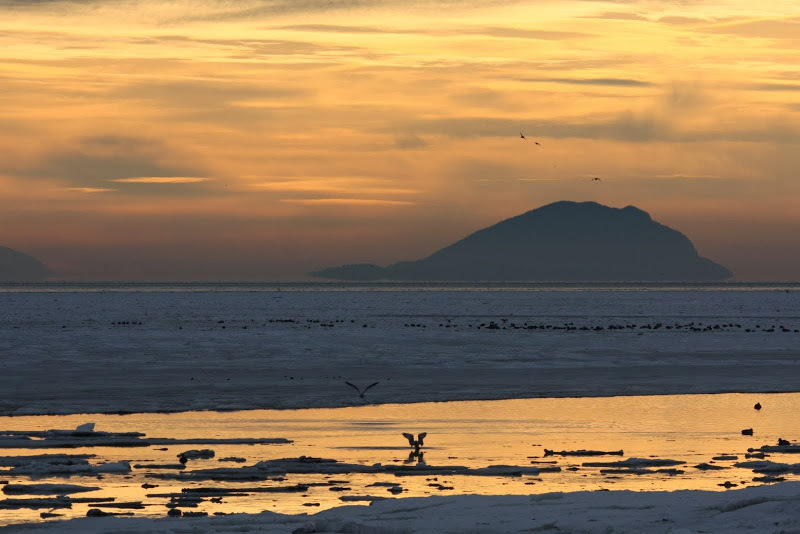 At the beach, the ice went out a long way, so the rafts of waterfowl were far out in the distant open water. A couple of Killdeer flew by, and two Greater Yellowlegs were close to us in an open patch. Martyr Moira scoped lots of Baldies on the ice and a few Great Blue Herons too. The view of Mt. Baker across the Bay in the early morning light was fantastic. We continued our walk past the Concession Stand, but there wasn’t much activity in the bushes. We saw common species like Song and Fox Sparrows, Juncos, Robins and Towhees, and Anne phished a Lincoln’s Sparrow. Terry eventually got a photo. Roger took the first obligatory Group Photo at the Lookout. 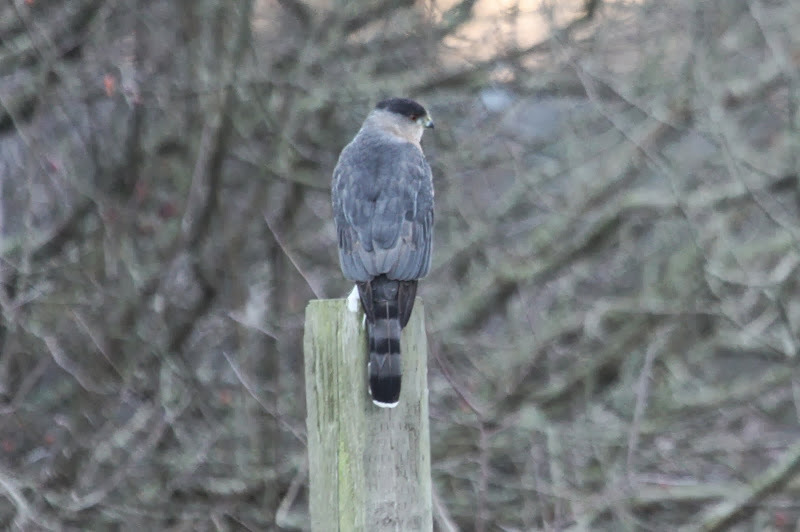 We watched Northern Harriers cruise by and one posed on one of our old bird box posts for a photo op. Then a neat Cooper’s Hawk flew by and landed in a nearby tree. As we approached the Pump House, there was a bit of open water, and there were about 4000 ducks and Canada Geese huddled around it; mostly American Wigeons with several Eurasians scattered among them. Lots of Green-winged Teal and Northern Pintail there too and a couple of Gadwall on the inland side of the path. In the Pump House pond with the Mallards and Wigeons were two pair of gorgeous Hooded Mergansers. Anne spotted a Wilson’s Snipe fluttering by above us but it didn’t stick around for a photo shoot. and then a lost newbie, White Rock Judy joined us. We heard lots of chip calls from the bushes, but the birds were mostly hunkered down in the cold. As we were heading home/CH, and lamenting the lack of activity, a bush in front surprised us with a mixed flock of several species including: three Cedar Waxwings, both House and Purple Finches, and Golden- and White-crowned Sparrows. Shortly thereafter we had a flyby of a garbling Gerhard. We did not see Otto’s requested Swamp Sparrow, but interestingly, one was reported seen just today (Thursday, Dec. 12) across the Bay near the 72nd Street pump house. We arrived back at CH shortly after the scheduled 11:30 a.m. and Jennifer, Jean, Jonathan & Lorraine welcomed us with scrumptious home-made scones and cookies, cheeses, fruit and hot drinks. We didn’t see a lot of rare species, but there was certainly no lack of social intertwining as demonstrated by the non-stop chatter all morning. Roger took another Group Photo of the stuffed participants on the CH steps. 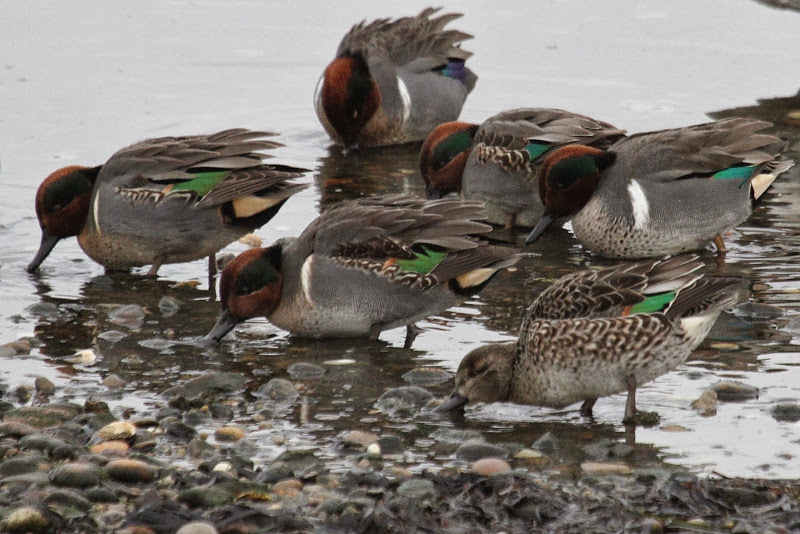 Although we were blanked on large flocks of Shorebirds, check out Terry’s Picasa photos of our outing on Tuesday to Blaine and Semiahmoo (the other side of the Bay) where we saw thousands of Dunlin, 4 Grebe species, 3 Scoter species and lots of other neat stuff. Next Monday, December 16, we will meet at and leave from Petra’s at 7:30 a.m. (Change to 8:00 a.m. the following week) on a local outing “somewhere around the Bay”, perhaps to check out the Snowy Owls or the Rock Sandpiper. Don’t forget the Ladner Christmas Bird Count (CBC) on Sunday, December 22; we want to retain our Number One Canadian status. 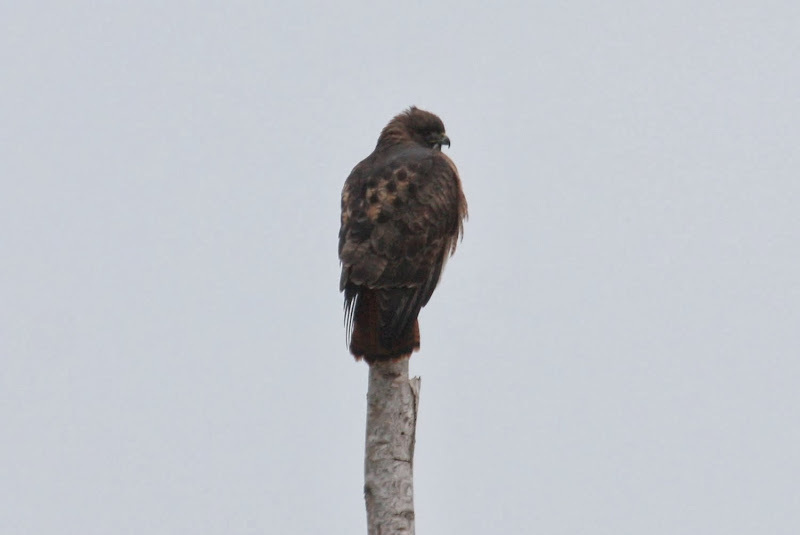 This entry was posted in *DNCB, Bald Eagle, BBRP, Birds-on-the-Bay, Cammidge House, Cooper's Hawk, Lincoln’s Sparrow, Northern Harrier, Red-tailed Hawk, Wilson's Snipe. Bookmark the permalink.